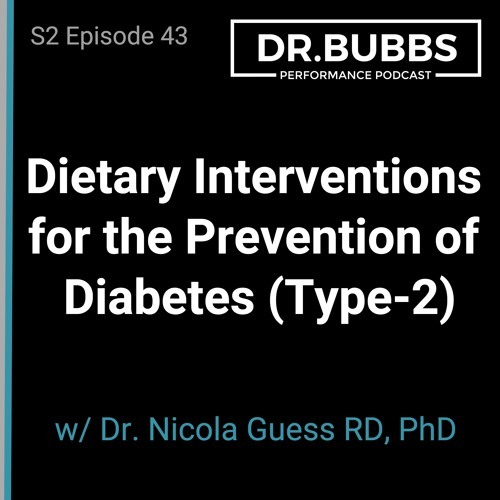 Season 2 Episode 43, Dr. Bubbs interviews diabetes expert Dr. Nicola PhD RD to talk all things diabetes (type-2) and nutrition. Nicola defines pre-diabetes and diabetes (type-2), outlines the current nutrition guidelines for the prevention of diabetes (T2D) and why we’re struggling with epidemic levels of diabetes worldwide. She also highlights how weight loss is the biggest driver of diabetes prevention and delves into different nutrition strategies – low-carb, Mediterranean, intermittent fasting and low energy diets – to achieve this goal. As well, Nicola touches on how the rate of weight loss appears to be an independent driver of the glucose-lowering effect, the importance of the first insulin response in this whole story, and her thoughts on how to stem the tide of the current diabetes (T2D) epidemic.